Refugees desperately ask for opening the border to Hungary from Serbia, after it was closed one day earlier. With the border closed, Croatia became the replacement for Hungary on the route. 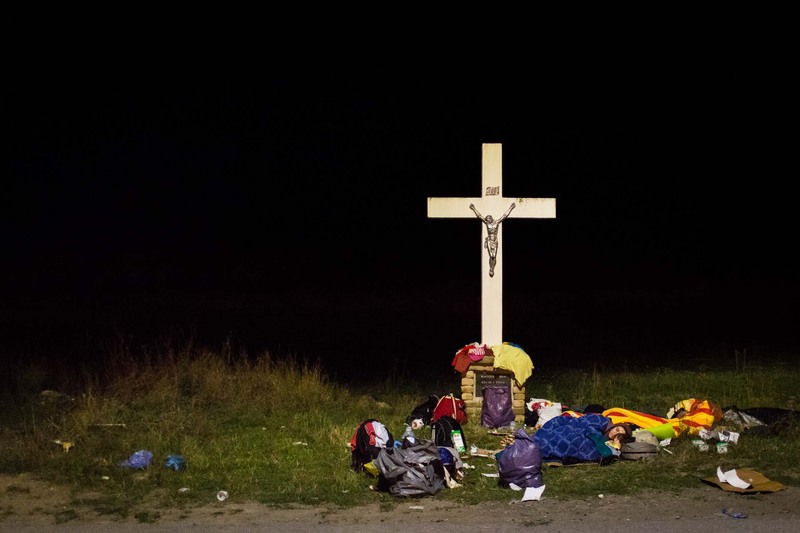 With the border between Serbia and Hungary closed, many people set up camp on a now closed highway directly on the fence separating the two countries. 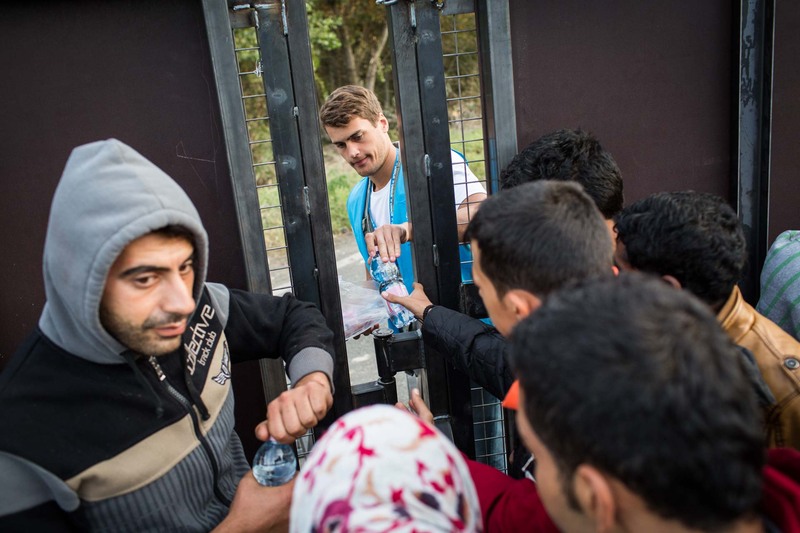 Volunteers distribute water from the Hungarian side of the fence because Serbian officials are not distributing any help on their side of the border. 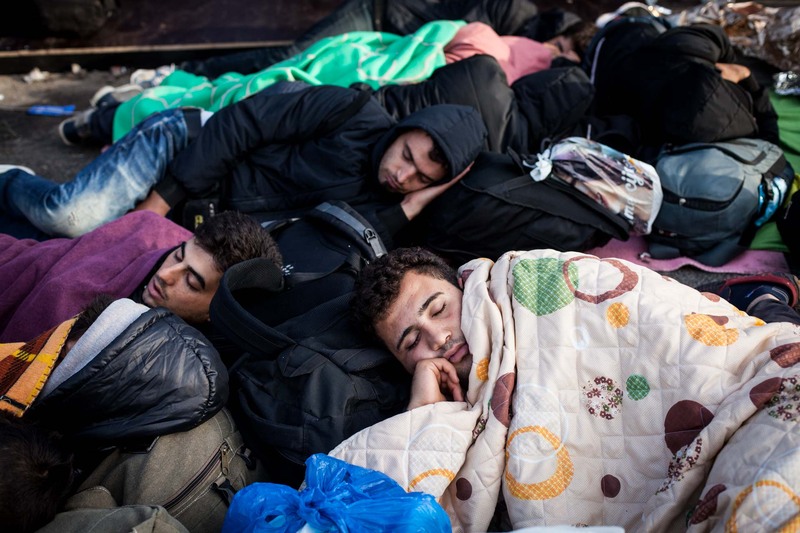 A group of young men sleeps beneath blankets on the closed border to Hungary. A father comforts his child on a parking lot near the border to Hungary. 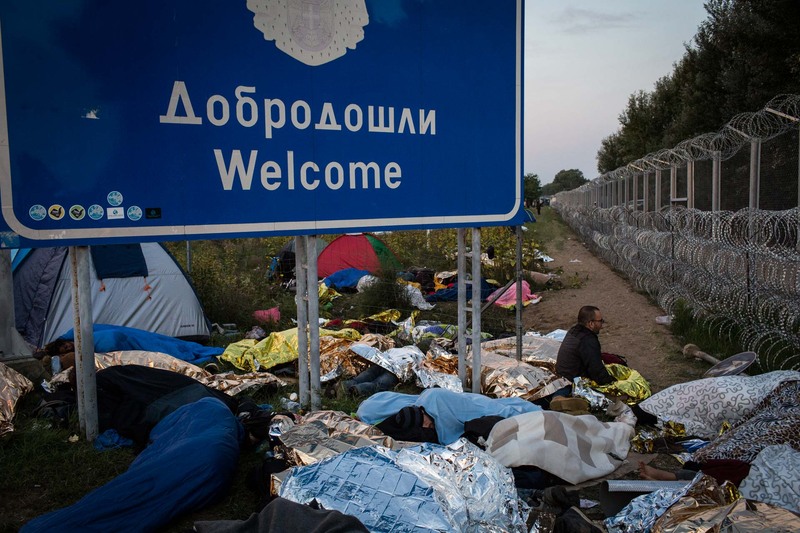 With the way to Hungary closed, many refugees diverted to Croatia instead, in order to get to Western Europe. 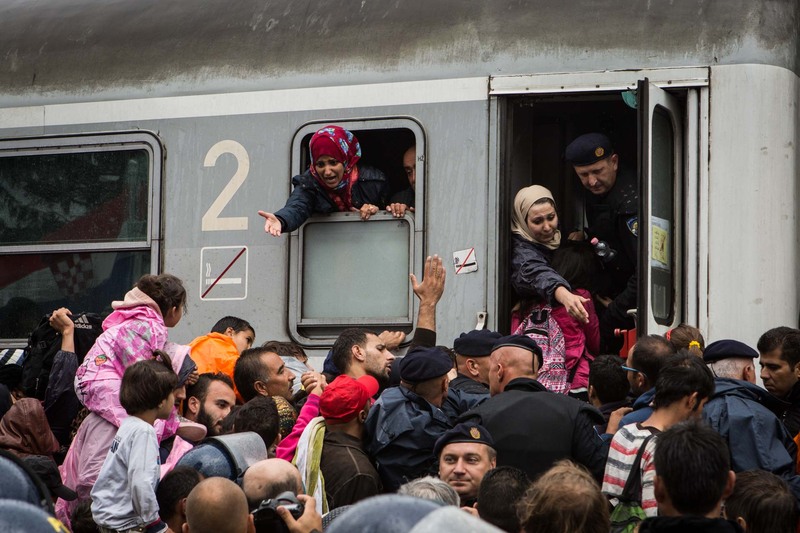 After waiting for days for a transport to transfer them to Slovenia, thousands of people fight for a spot on a train. 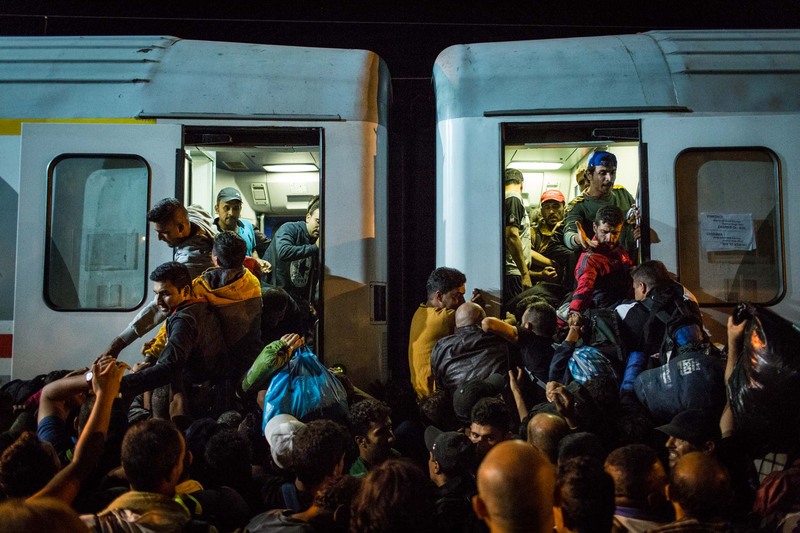 With the very limited capacity of the train transferring them to Slovenia, many refugees lost all compassion and empathy and started to fight for a place on the train. 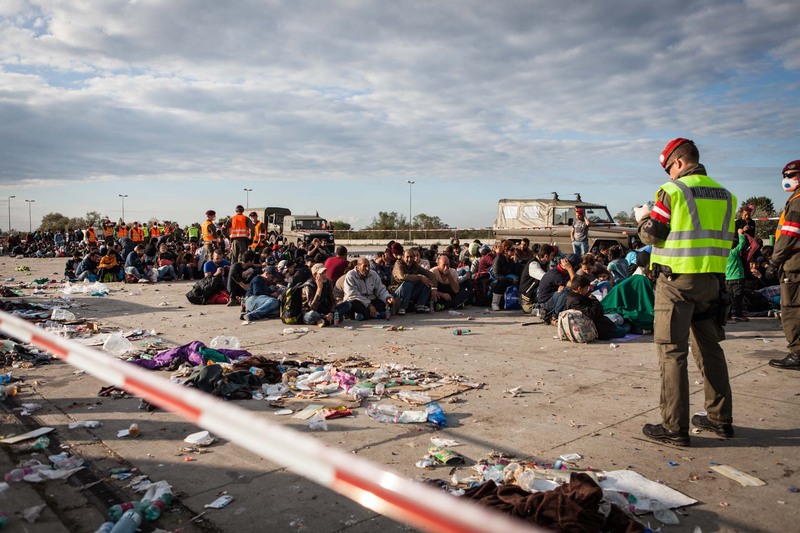 Croatian police was heavily overwhelmed by the Thousands of people that arrived in the last days of September, hoping to find a way to Western Europe. With too many people on the train, the amounts of space and air became dangerously small. Because these people are sitting in a first-class compartment with a (non-working) air condition, they are not able to open the windows. Here, children wrote "Help" and "O2" (Oxygen) on the windows that are dripping from condensed water. Many people collapsed and had to be removed from the trains. Croatian police later called it a miracle that no one had died. A father wants to bring his small kid with him on the train, while another man wants to remove him, in order to get a place for himself. 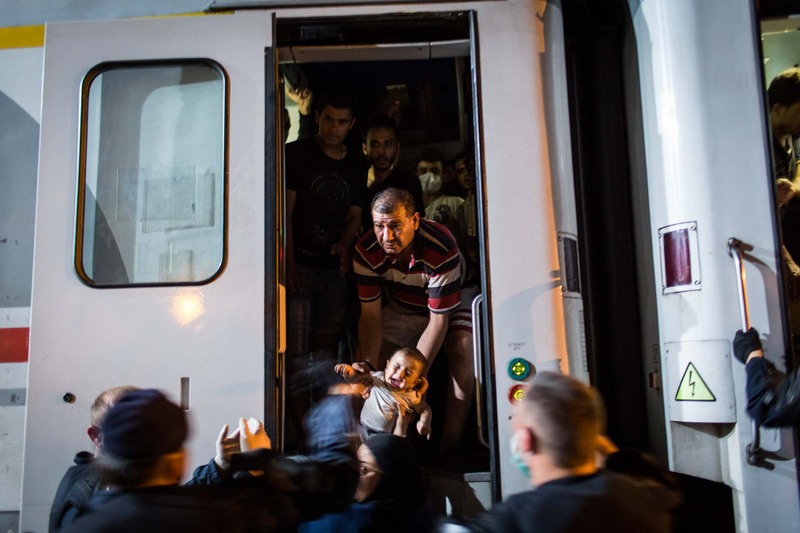 After being removed from the crowded train, a small girl is terrified of the masses of people that are so desperately looking to board the only means of transport to Slovenia. 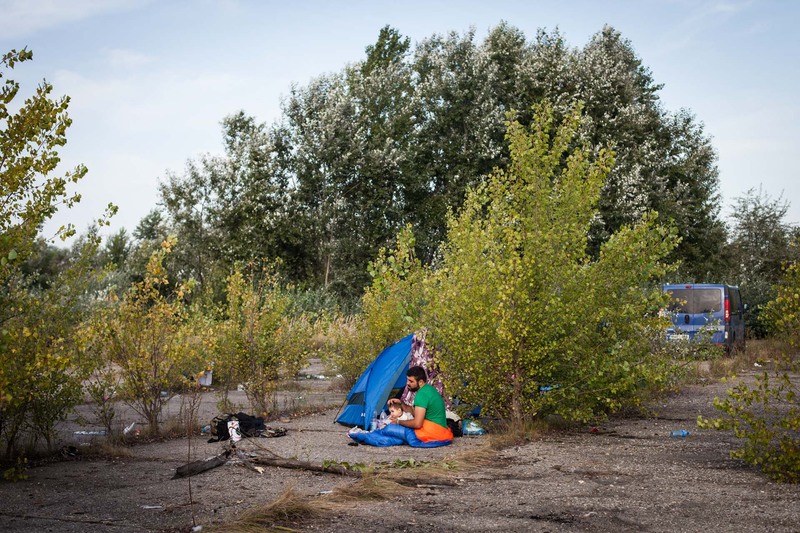 A Syrian family set up temporary camp next to a big cross near the railway station in Tovarnik, the first village in Croatia after they crossed from Serbia. 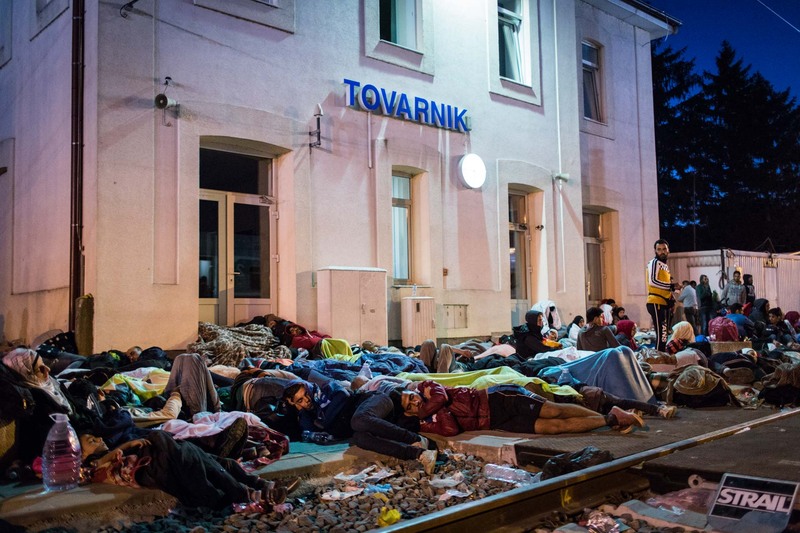 Refugees unable to find a spot on the train to Slovenia, sleep at the railway station of the small border village Tovarnik. 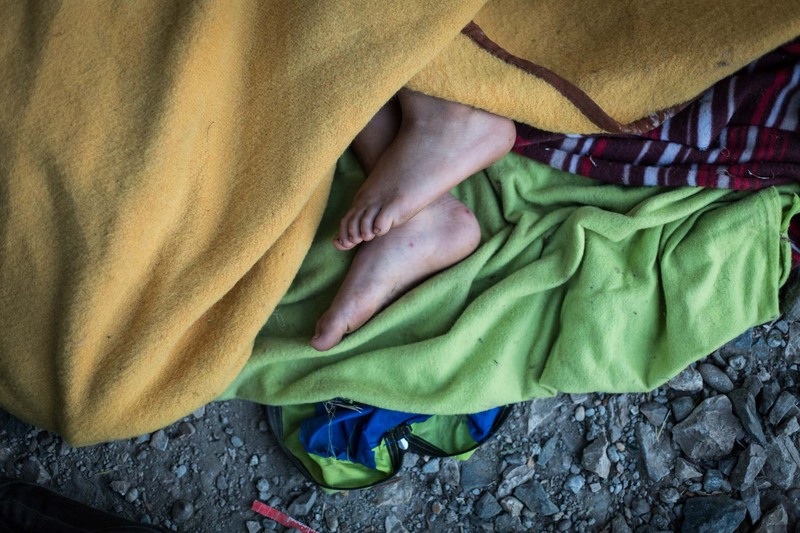 The feet of a boy are showing from beneath a blanket in the morning after spending the night in Tovarnik, Croatia. With tensions high, two refugees started to fight. One man accused another of trying to steal a blanket. Croatian police is about to separate them. 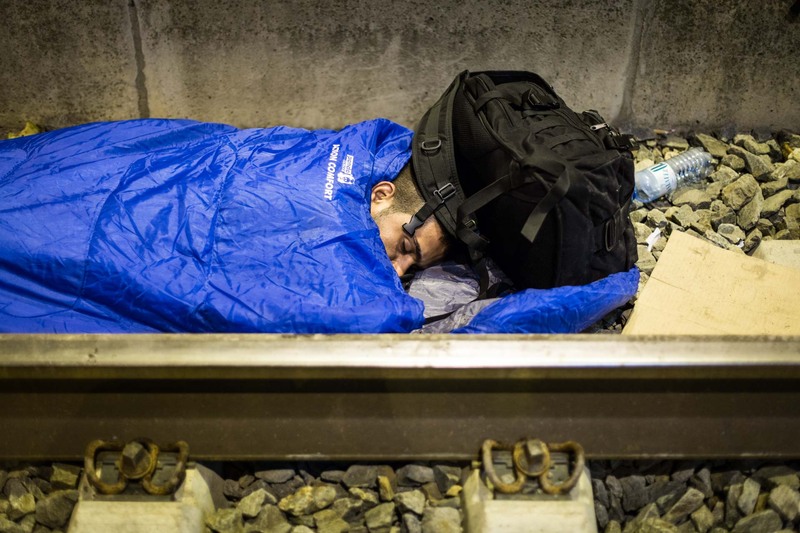 A man is spending the night next to a rail in front of the train station in Tovarnik, Croatia, waiting for a train to Slovenia. 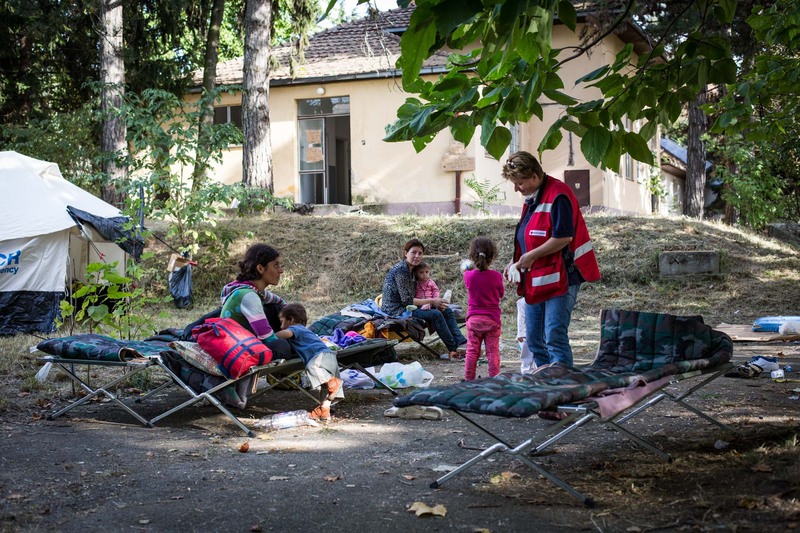 The Croatian red cross set up a camp in a nearby former army base to accomodate hundreds of people waiting to continue their journey to Europe. 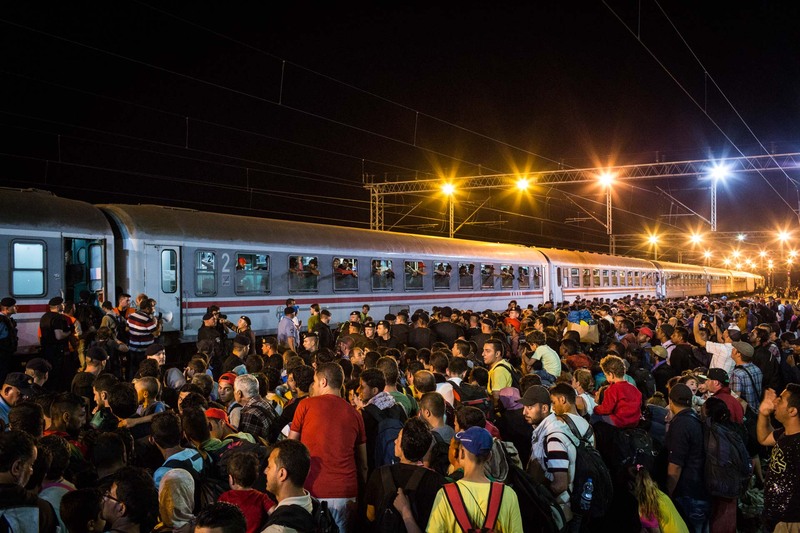 Thousands of people wait for Croatian police to put them on one of the very few trains to Slovenia. 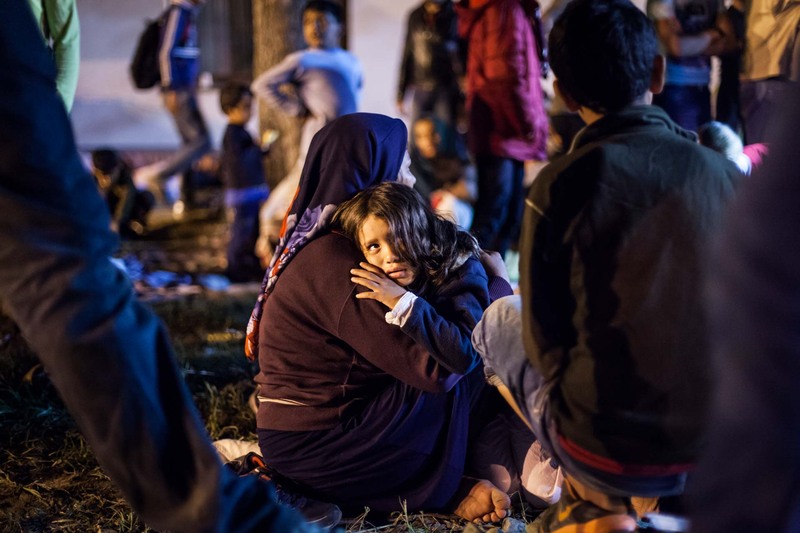 Within the first few days, Croatian authorities were overwhelmed with the massive influx of thousands of people coming to Tovarnik every day. 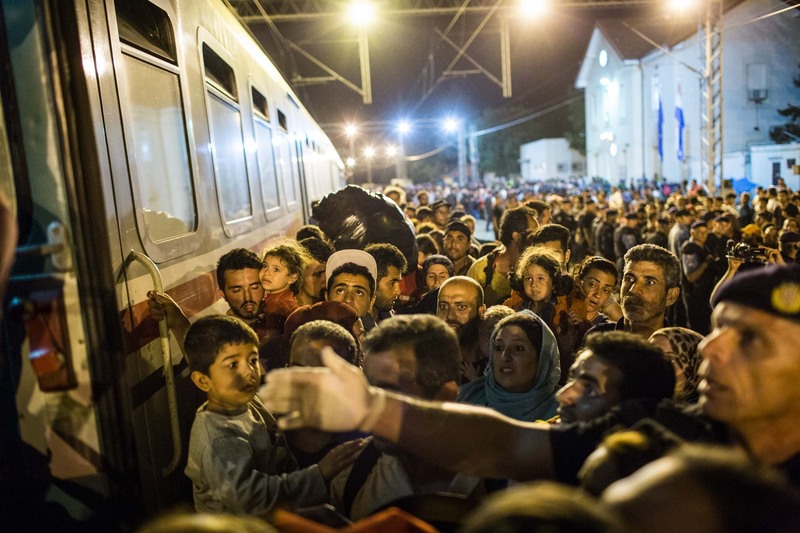 Despite the pressure, they never used force on the refugees like many other Balkan countries did. 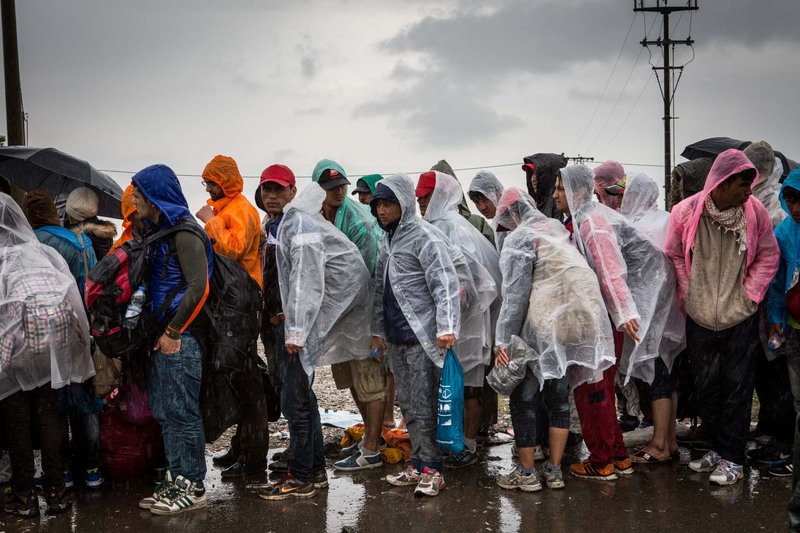 Refugees queue up for a place on a bus to Slovenia, while a rainstorm sets in in Tovarnik, Croatia. A mother on a train to Slovenia is screaming at the top of her lungs to get her child trapped in a crows of people. 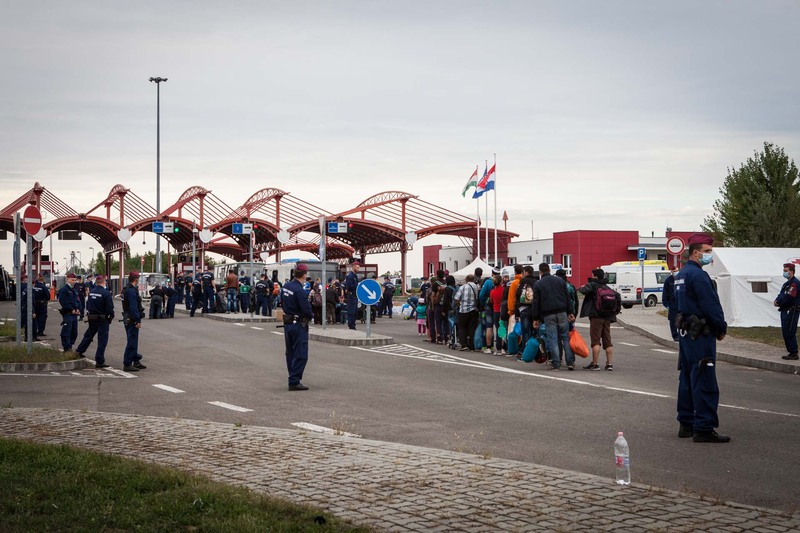 After Hungary closed its border to Serbia, it still allowed refugees coming from Croatia to cross to Austria in small numbers. These were the last people to legally set foot on Hungarian soil, before the conservative government of Orban shut down the country to refugees completely. Refugees that recently arrived in Nickelsdorf, the border crossing to Hungary, wait for a transport to the German border. A few days later, not a single refugee used this crossing any longer with Hungary closing its borders completely. 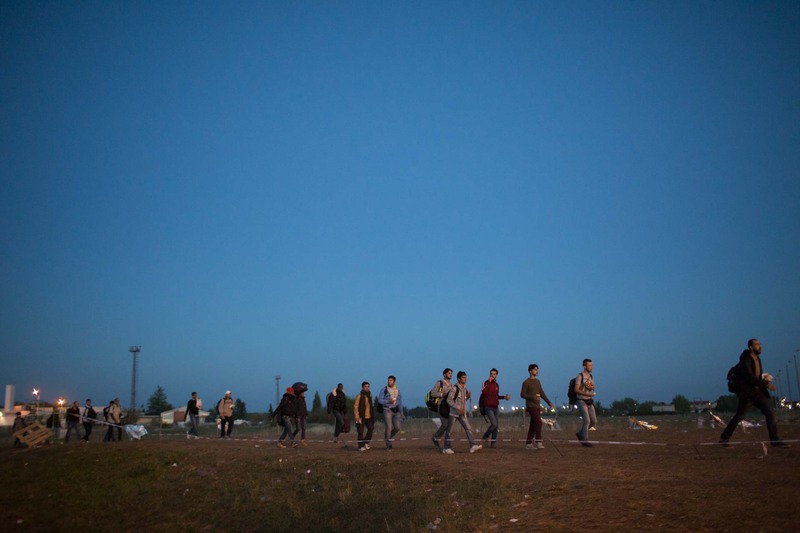 Refugees make their way to the Austrian border crossing of Nickelsdorf from Hungary on foot. 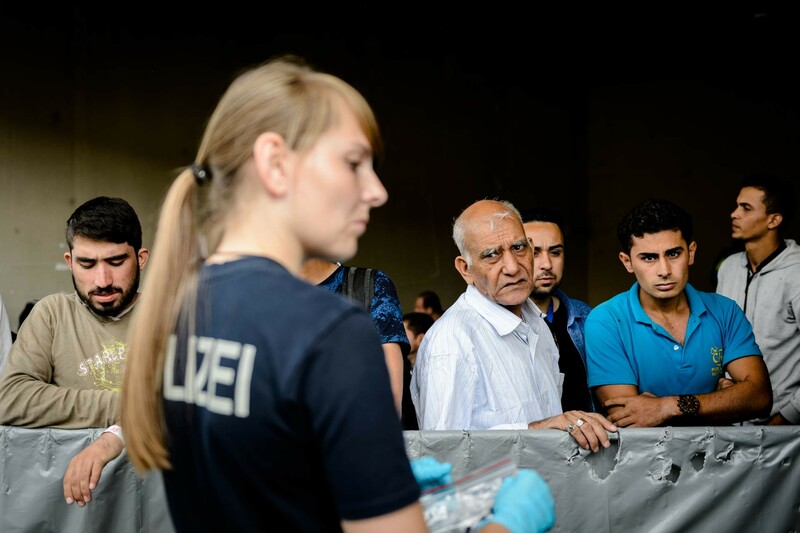 Refugees that recently arrived to Passau, a small border town in Germany, wait for their re-transfer to a processing center, where they can officially apply for asylum. 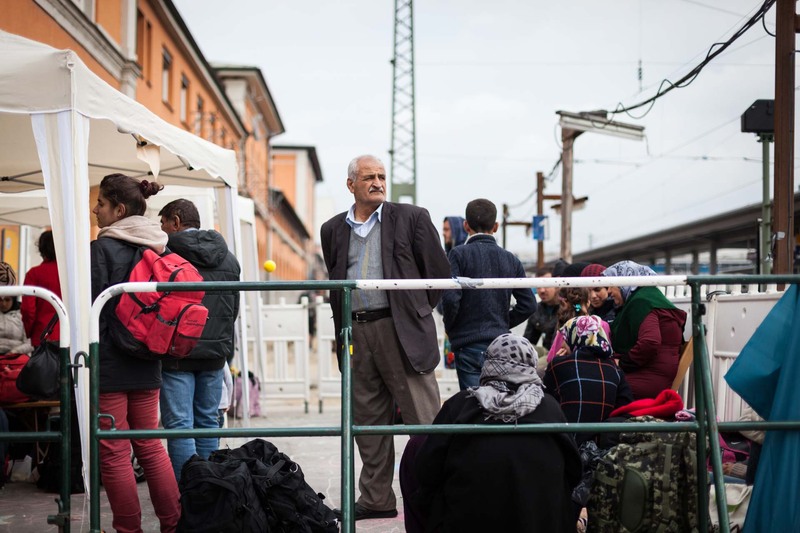 A Yezidi man from Sinjar in Iraq is waiting for an ambulance for his wife at the train station in Passau, Germany. She twisted her ankle somewhere in Serbia. 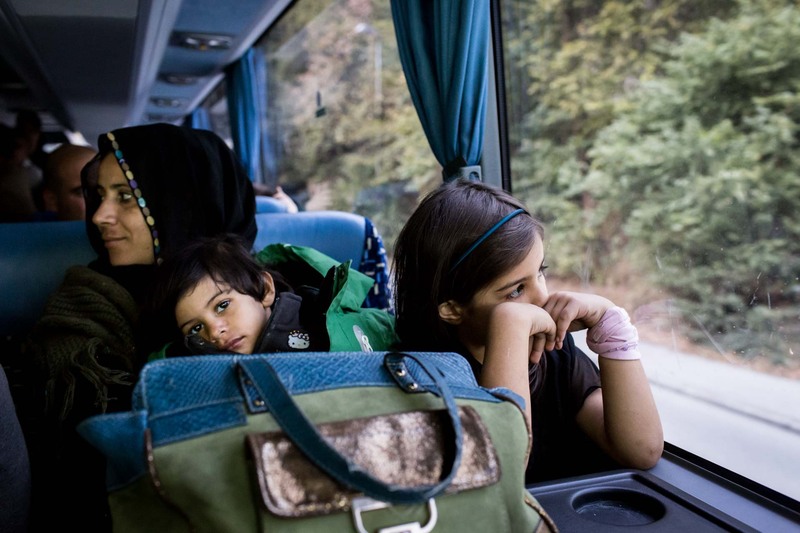 A family from Iraq sits in a bus of the German federal police in Passau, Germany, on their way to a processing center, where they will get a transport to an asylum center to apply for refugee status. 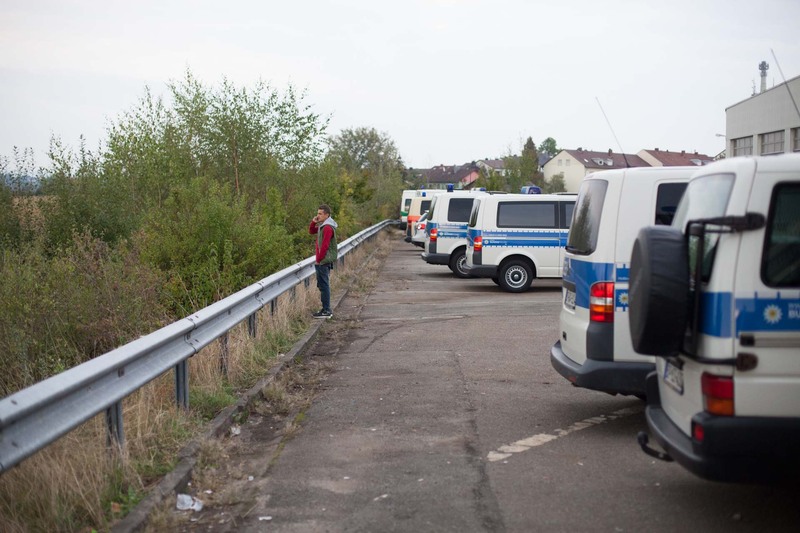 A young Syrian boy stands behind police vehicles in Passau, Germany, to tell his family that he has made it to Germany safe and sound. 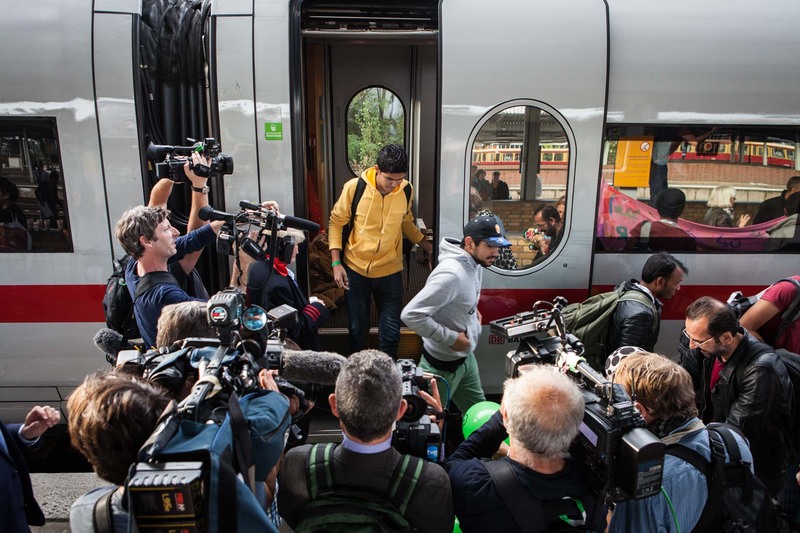 A special train from Munich brings 700 refugees to Schöneberg train station in Berlin, where they are received with food, water, medical care and a lot of press. For most of the refugees arriving in Germany, this is the end of their journey. With a growing number of countries in the Middle East and Africa in political and economical instability, many people leave their home in order to start a new life in Europe. 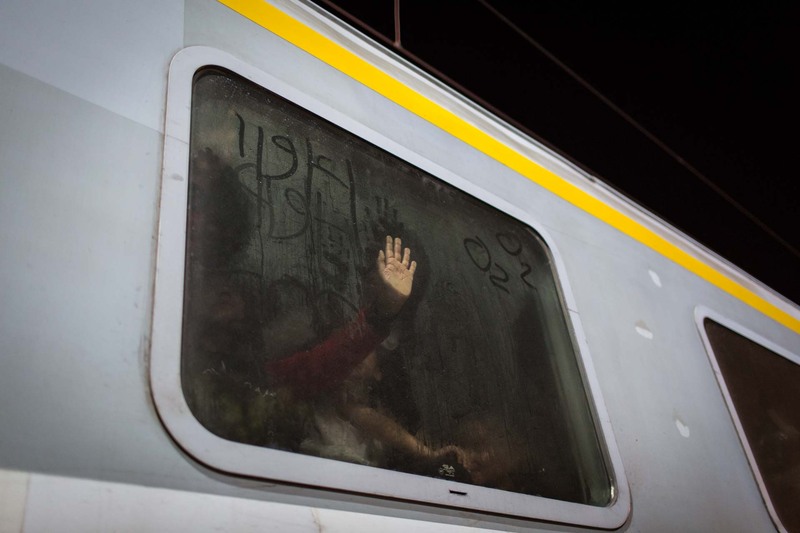 The reasons are diverse, and so are the people leaving for Europe. 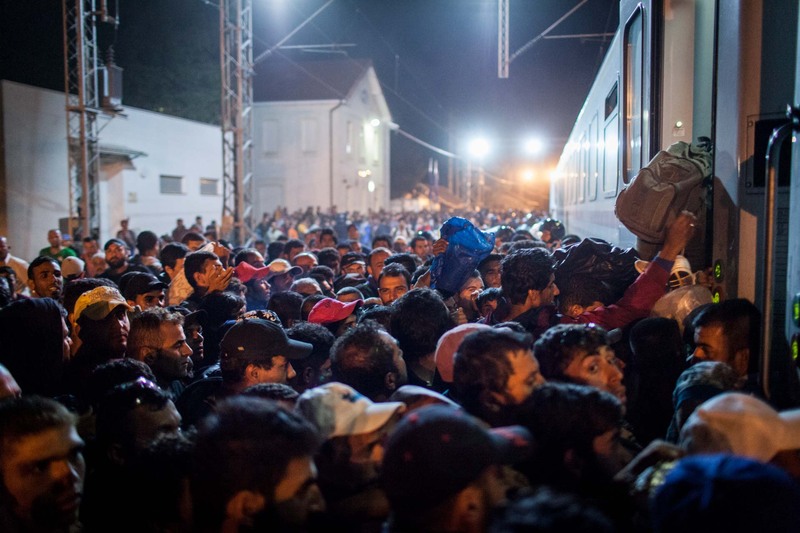 After the route to Europe became more and more accessible through Turkey and the Balkans, Europe suddenly had to deal with the influx of hundreds of thousands of people. Many poor countries along the route couldn’t handle the sheer amount of people arriving. 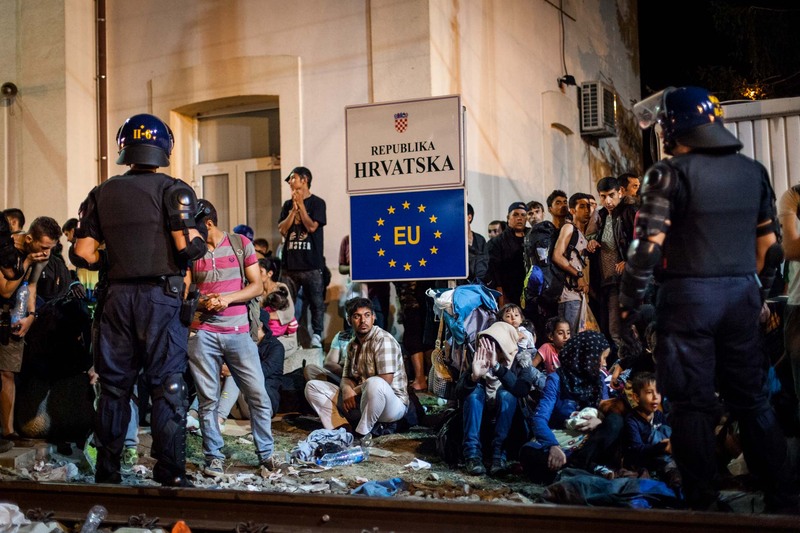 By summer 2015, a human tragedy was on the brink: Hungary closed its border, making Croatia and Slovenia the next transit countries for people seeking refuge in Central Europe. The European Union and its members are facing the biggest crisis since they have been established.